E-readers have quickly come and gone. In this day and age where your entire virtual book collection can easily be stored on your smartphone or tablet, there just doesn’t seem to be any logical need as to why you would ever need a separate device, such as a Kindle, just to do your daily reading. While Kindles do come with some interesting features, such as a glare resistant screen, being easy on the eyes when reading in dim light, and a long battery life; that’s pretty much where anything noteworthy ends. Despite this, Amazon has once again released a new Kindle model, so it obviously still has some popularity, unlike their failed venture into the smartphone business. Coming in at only 4.6 ounces with a 6” screen, the Kindle Oasis is now Amazon’s main e-reader, and packs quite the punch when compared to previous versions. The Kindle Oasis is 20% lighter and 30% thinner than previous Kindles, and comes with dual battery slots that oversteps previous Kindles battery lives of several weeks, and bumps it up to several months. Unlike the standard Kindle, which has a resolution of 167 ppi, the Kindle Oasis lines up with the Kindle Paperwhite and the Kindle Voyage with a resolution of 300 ppi. This provides readers with crisp text, and greatly assist those who aim to read in the dark. You can turn pages with ease via the touch display, or the page turning buttons on the handgrip. The Kindle Oasis also aims to replicate the feel of holding an actual book with its ergonomic design and sleek leather cover, securely attached to the Kindle via 12 magnets. Smooth and firm, you’ll also get your pick of black, merlot, or walnut colors during purchasing. The dimensions of the Kindle Oasis are 5.6" x 4.8" x 0.13-0.33" (143 x 122 x 3.4-8.5 mm,) and you will be able to select either the Wi-Fi or Wi-Fi + Free 3G variants during purchasing. The Amazon Kindle Oasis will be released on April 27th, 2016, and is currently available for pre-order. 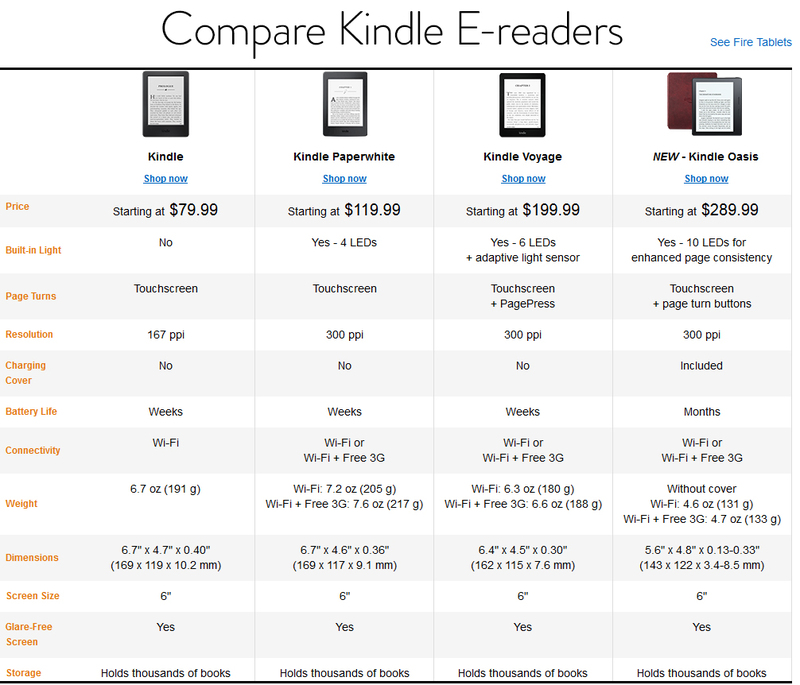 It costs $289.99, roughly $210 more than the standard Kindle. Whether or not the bonus features are worth shelling out the extra cash for is up to you. What are you thoughts on Amazon’s new E-reader? Vino, boonk and Pyroman like this.